Elsevier, the charming little startup can force Swedish ISP Bahnhof to block SciHub. Due to IP BS. This is the world we live in. I would love to see regulatory guidelines be developed by a github-like tracking system, to make absolutely transparent who introduced which nonsense into which guideline. I think the regulatory authorities owe this transparency to people who pay their salaries. Don't expect this to happen within the next 100 years. As usual, I am not so much asking you how you think others would do it in other contexts. I am asking you how you would do it. Let us for simplicity assume there is a peak around 5 units here and that we know nuffin about anything except y3 and t.
You are of course also welcome to eyeball it and tell me the level of s:n. Make all the assumptions you wish. Change data as you please. Note: true chromatographic raw data are much uglier than this. Whatever you see when visualizing peaks with or without smoothing, bunching and gamma modality or whatever the heck it is called involves a lot of signal conditioning in all major packages. As I wrote here in the past: Don't mess around tooo much with the LLOQ as this is in general not good for ones mental health. Some issues there might easily blow your mind if you start thinking about too long. Some kind of life-death boarder for your analytical method and a philosophical conundrum of a large scale. it is at the LLOQ the magic is needed. This is where the s:n is measured, also. At present we have about 70 companies pursuing Tiotropium/Formoterol/Salmeterol/Fluticasone/and so forth approvals and for some of those methods we need an LLOQ of 0.1 pg/mL and not one iota less; even with the API6500 Qtrap and similar equipment this is at the border. The opportunity for assay optimizations have been exhausted (including columns, derivatization, SPE/LLE, and much mnore has been explored), the agency might not approve higher doses than a single shot per subject per period and we need to bear in mind that Cmax/LLOQ should be 20 or better. » You are of course also welcome to eyeball it and tell me the level of s:n.
You are a nasty person. Noise increases with time. Before the peak ~6.93, after ~8.30, x ~7.62. Peak height 13.7 gives S:N ~1.8. Not an awful lot. Eyeballing, of course. No silicon-based life form would agree with me. If you find an error, you can keep it. That's how I do it too. I don't trust automatic calculations by whatever software. It depends so much on the parameters you enter. You may get a S/N of 30 with the plot you provided. Nonsense. » Peak height 13.7 gives S:N ~1.8. Not an awful lot. With a visual quick and dirty look I would have said 3, but I was too fast and I was wrong (stupidly took the signal from the bottom of the graph). Revised slower-and-still-dirty estimate 2. Thanks for your qualified opinions. where the red line indicates the level of noise (in this case, right of the peak) and the greeen one is the signal. Roughly. Note that in both cases I quantify s as well as n in one direction from the baseline mean or median or whatever. Thus I am landing at s:n = (18-4.1) / (8-4.1) = 3.6. I am not in any way claiming this is better or worse, only that this is my idea of an approach. k=3 #a miserable sad pointless constant to make s:n look better ?? which gives a result of about 5. 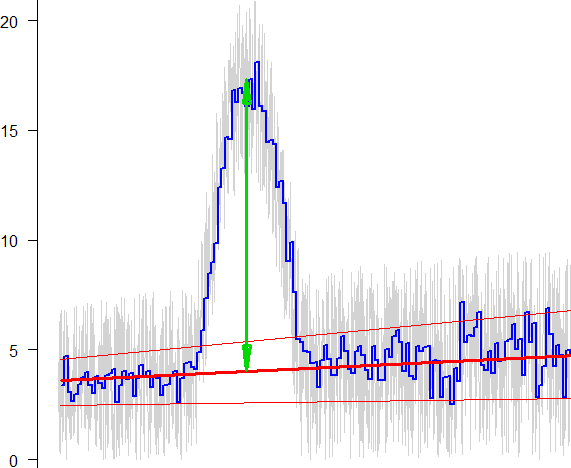 » where the red line indicates the level of noise (in this case, right of the peak) and the greeen one is the signal. Roughly. » Note that in both cases I quantify s as well as n in one direction from the baseline mean or median or whatever. » Thus I am landing at s:n = (18-4.1) / (8-4.1) = 3.6. » I am not in any way claiming this is better or worse, only that this is my idea of an approach. OK, you are aware that this is not according to the textbooks about chromatography.1 See also Dolan’s figure 1.2 Noise is defined as the range of recorded “zero” signals. Hence, your S:N is by a factor of two better than mine. » k=3 #a miserable sad pointless constant to make s:n look better ?? » which gives a result of about 5. … and, voilà, an S:N of ~4.7. Signal bundling is not done for fun. Peak detection (start/end) requires the 1st derivative of the signal and finding the “peak’s summit” the 2nd. See these examples (slides 11–12). Difficult enough for bundled data, impossible for what you consider “raw data”. It’s simply a necessity for proper integration. Finding the right value is always a compromise. If you bundle too much, peaks will be distorted and separation between adjacent peaks suffers. If you bundle too little, the system will have a hard time detecting the right start/end of peaks. Nothing is perfect. Kuss H-J, Kromidas S (eds. ): Quantification in LC and GC. Weinheim: Wiley-VCH; 2009. Dolan JW. 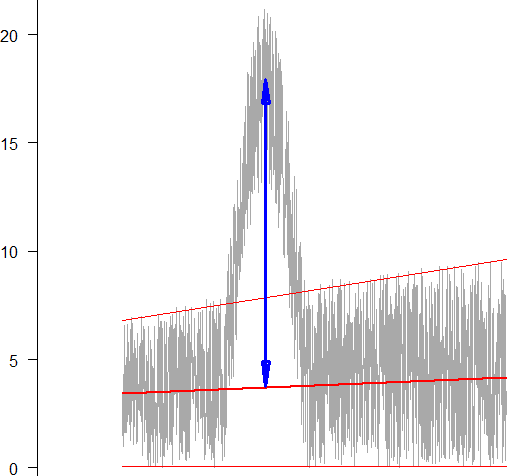 The Role of the Signal-to-Noise Ratio in Precision and Accuracy. LCGC North America. 2005:23(12);1256–1260. May I ask what we are doing here? Is this example peak the lowest calibration point? Or do you want to determine s:n for a patient sample (why?)? » May I ask what we are doing here? Is this example peak the lowest calibration point? Or do you want to determine s:n for a patient sample (why?)? This was just a digression. I asked noone in particular what s:n is and gave a example of a fictive simulated chromatogram on which the forum's experts could practice their skills and demonstrate knowledge. Shouldn't have done it. But now that you are here, what is in your idea of s:n ? How do you calculate it? Whether the series respresents an LLOQ or a PK sample or something entirely different is immaterial to this discussion. So.... what is s:n in your opinion? How would you prefer to quantify the level of noise and the level of signal? To be true: I prefer to know all (a lot of) facts, before I propose any solution to the problem. Maybe not so easy in a public forum, I know. But in my opinion the solution has to fit the problem you are addressing. Otherwise there would already be a DIN/ISO in place, or? » But in my opinion the solution has to fit the problem you are addressing. Otherwise there would already be a DIN/ISO in place, or? Feel free to make assumptions, change data, and feel free to assume it is a spiked plasma sample at the LLOQ in a bioaalytical validation or feel free to make any other assumption that allows you to think you have a solution to the question. I am curious as to what the solution is, as in, how exctly is signal and noise quantified (once I have that I think I can make the division myself, but I am not even 100% sure about it). IMHO, calculating the S:N is no more than a finger excercise unless required by the method (e.g., traces in accredited environmental analysis where a true blank matrix does not exist). In bioanalytical methods I'm not sure whether it should be part of an (optional anyway) system suitability test. Playing the devil's advocate - two methods, A/P at the LLOQ 20/20%, S/N 10 or 15/15 5? » IMHO, calculating the S:N is no more than a finger excercise unless required by the method (e.g., traces in accredited environmental analysis where a true blank matrix does not exist). Yes I think this is my point stated in oher words. There is no universally agreed method to define s:n so as a consequence it is hardly effective or relevant to have a rule about its quantity. » In bioanalytical methods I'm not sure whether it should be part of an (optional anyway) system suitability test. Playing the devil's advocate - two methods, A/P at the LLOQ 20/20%, S/N 10 or 15/15 5? I don't follow this terminology, can you explain what you mean? My hindsight is 20/20. S:N is done at the LLOQ, as far as I know. If it is "good enough" at the LLOQ then it is supposedly also "good enough" (whatever that means) anywhere above the LLOQ. Formally, the limit of detection (LOD) is defined by the S:N ratio. The peak you can definitely distinguish from noise (Limit of blank) with your method. In bioanalytics the LLOQ is by definition the concentration you can determine with P/A of 20%/+/-20% (by a convention method, i.e spiked samples with n=......). If you (or anybody else in the room...) think your LOD is higher than the LLOQ, you have a problem, in deed. Otherwise... see Helllcourages statement. » » [...] two methods, A/P at the LLOQ 20/20%, S/N 10 or 15/15 5? » I don't follow this terminology, can you explain what you mean? My hindsight is 20/20. Sorry, my wording was not clear. I meant: Both methods fullfil the required conditions for (in)accuracy and precision at the LLOQ (20%). The first one is right at the border (20/20) but with a nice S:N of 10. The second one is better in terms of A/C (15/15) despite a worse S:N of 5. I guess most people would prefer #2. I don't see the purpose of S:N. IMHO, it is nice to know only. » I don't see the purpose of S:N. IMHO, it is nice to know only. EMA: " (...) the analyte signal of the LLOQ sample should be at least 5 times the signal of a blank sample"
Do you evaluate peak height as the signal for your assay? Or peak area? » Do you evaluate peak height as the signal for your assay? Or peak area? - not its integral over time. » » Do you evaluate peak height as the signal for your assay? Or peak area? Is that somewhere stated, that peak height is the signal? You need a baseline (whatever that is) to establish this signal (as for the area, so both parameters don't fall out of the clear blue sky but might be considered convention methods, as the PO has noticed). Why not using the same signal as used for calculation of P/A, i.e. most often area? OR ratio of area with IS? » Is that somewhere stated, that peak height is the signal? Not only the two references I gave above but all about detection in chromatography since the 1960s. » You need a baseline (whatever that is) to establish this signal (as for the area, so both parameters don't fall out of the clear blue sky but might be considered convention methods, as the PO has noticed). Why not using the same signal as used for calculation of P/A, i.e. most often area? OR ratio of area with IS? Simple. Given the CDS's settings appropriate to integrate the peak (bunching, smoothing, slope limits for start/end, area threshold) the noise will not be integrated. BTW, I'm curious how other members of the forum calculate the noise. » EMA: " (...) the analyte signal of the LLOQ sample should be at least 5 times the signal of a blank sample"
Oh dear, I missed that for years. Biased perception. Let me continue my series of methods. Number 3: A/P 10/10% but S:N 3:1. Although I have some doubts whether we can achieve such a nice A/P with such a bad S:N, let it be. I consider this one the "best" of the three. I would never ever use one of the others only cause the S:N is higher. » Let me continue my series of methods. Number 3: A/P 10/10% but S:N 3:1. Although I have some doubts whether we can achieve such a nice A/P with such a bad S:N, let it be. Hopefully AniML, an open XML based schema for Analytical data gets traction to push adoption.